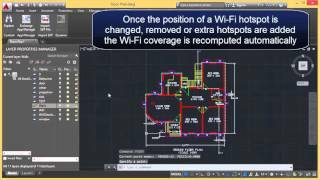 Dynamo Wi-Fi Planner for Autodesk® AutoCAD® is an add-in that extends the functionality of AutoCAD® and allows exporting of geometry from AutoCAD to Dynamo®. Dynamo runs mathematical computation of Wi-Fi distribution, graphically represents results and deliver them back into AutoCAD. Dynamo Wi-Fi Planner for AutoCAD is based on Dynamo. Dynamo is an open source graphical programming tool for design. It extends building information modeling with the data and logic environment of a graphical algorithm editor. Dynamo requires Revit 2017, 2018 or 2019 is installed. For more details about Dynamo please visit http://dynamobim.org/. Graphical representation of results in both Dynamo and AutoCAD.